I was raised as a Lutheran, the original Protestants. When I came home from my public school talking about evolution, my devout mother said, "Isn't it incredible that this is how God chose to create the world?" In other words, I grew up in a family in which religion and science went hand-in-hand, one a living proof of the other. Facts, logic, and reason were the language of God, and each new revelation made by science was a new revelation about God's creation. This is how I've lived most of my life, blissfully unaware that there were cults taking the view that science was somehow in opposition to their Christian-ist beliefs. These are fundamentalists. Every faith has fundamentalists, and in every case these are the dangerous believers. Fundamentalists commit acts of terrorism. Fundamentalists view non-believers as sub-human, heathen, infidel. Fundamentalists have no faith in a living god, but rather in a literal reading of dry ancient words interpreted for them by pastors, priests, and imams, which is how it comes about that they deny science: their version of god stopped speaking 2000 years ago. Oh, I understand that I'm walking into a brier patch here, one in which I'm certain to be bloodied by the thorns of religion and politics, but damn it, every time I look for trouble in the world I seem to find a fundamentalist of some sort at the bottom of it. Every time. Jesus Christ was absolutely not a fundamentalist. Martin Luther was absolutely not a fundamentalist. They were both true, lower-case protestants: men who stood against the entrenched fundamentalism of their time. So why write about this here? Why today? When I first saw this, I thought it must be a hoax, but Snope.com has confirmed its authenticity. 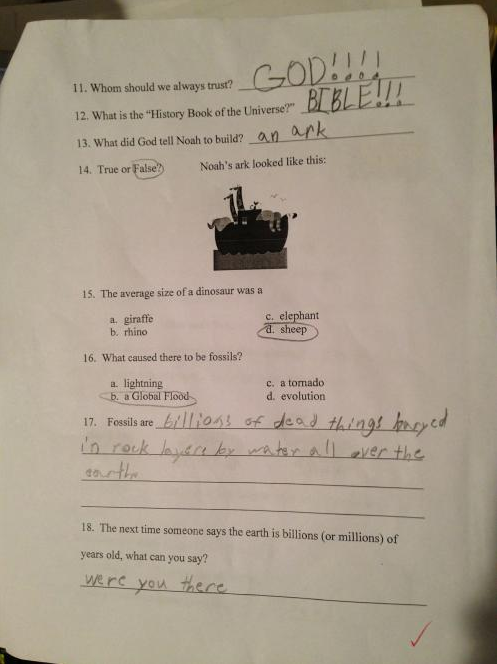 This is actually what children are being taught at the Blue Ridge Christian Academy in South Carolina. Apparently, according to Snopes, this quiz is based upon a curriculum developed by the same folks who brought us the anti-science "Creation Museum" in Kentucky. Now, this is a private school, of course, and people are entitled in a private school to teach their children anything they want, even if it's pure religious indoctrination, but increasingly these schools are receiving public money via charters and vouchers, making them part of our public educational system, and that makes it all of our business. The school willing to accept the most voucher students -- 314 -- is New Living Word in Ruston, which has a top-ranked basketball team but no library. Students spend most of the day watching TVs in bare-bones classrooms. Each lesson consists of an instructional DVD that intersperses Biblical verses with subjects such chemistry or composition . . . The Upperroom Bible Church Academy in New Orleans, a bunker-like building with no windows or playground, also has plenty of slots open. It seeks to bring in 214 voucher students, worth up to $1.8 million in state funding . . . At Eternity Christian Academy first- through eighth-grade students sit in cubicles for much of the day and move at their own pace through Christian workbooks, such as a beginning science text that explains "what God made" on each of the six days of creation. They are not exposed to the theory of evolution . . . "We try to stay away from all those things that might confuse our children," Carrier said . . . Other schools approved for state-funded vouchers use social studies texts warning that liberals threaten global prosperity; Bible-based math books that don't cover modern concepts such as set theory; and biology texts built around refuting evolution. The courts have ruled the state's voucher funding mechanism to be illegal, but the state is moving forward with it anyway. And Louisiana isn't the only state actively seeking to inject religious training into public education. 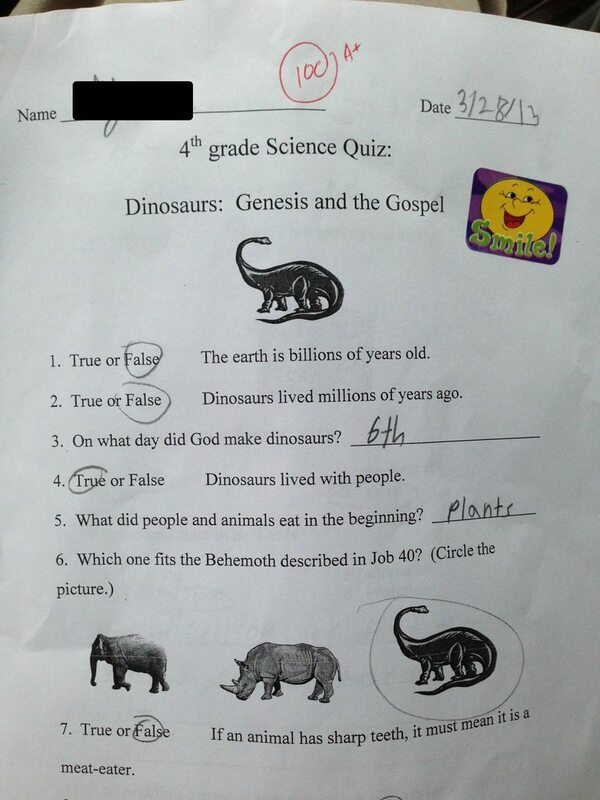 Public schools across the country, but mainly in the south, are actively teaching this kind of anti-science curriculum. If you want your children to learn this bunk, then Sunday school is the place for it. The purpose of public education in a democracy is so that we have a well-educated population, capable of self-governance. This type of fundamentalist theocratic education does the opposite. I shake my head for these poor children who will grow up to be laughed at by the rest of the world, but also for our own children who will be forced to contend with an ever-expanding know-nothing electorate in the already challenging job of self-governance. Democracy requires a population of critical thinkers, people with the intellectual flexibility to come to agreements with those with whom one disagrees on public matters. Private morality is the business of the individual, but public morality belongs to all of us and must always emerge from compromise. Compromise is impossible with fundamentalists. Fundamentalists will always be with us, of course, always out there as a threat to peace and prosperity, but our public schools cannot be in the business of intentionally creating them. That, at its core, is anti-democratic, anti-American, and frankly, anti-religion because it puts government directly in the church's business, the reason the devout James Madison gave for his own insistence on a separation of church and state. The ultimate danger of a fundamentalist of any kind lies in his dogmatic inflexibility: what he believes yesterday is the same as what he believes tomorrow no matter what happens today. But what those of us who don't deny science know is that what happens today always matters: that's where we actually live our lives.